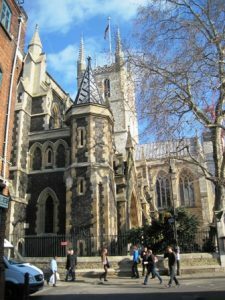 Southwark Cathedral, formerly the priory of St Mary Overie and later St Saviour, is on the south bank of the River Thames next to London Bridge. It has been a cathedral since the formation of the diocese of Southwark in 1905. The present building is mainly gothic dating from 1220 to 1420, although the nave is a nineteenth-century reconstruction in a thirteenth-century style. The retro-choir at the eastern end (which was the scene of Protestant martyr trials during the reign of Mary Tudor) contains four chapels and was part of the original priory, it is separated from the choir by a 16th century screen. To the left of the south west entrance is a section of arcading dating to the 13th century and nearby are medieval roof bosses dating from the 15th century. There are displays throughout the cathedral setting out its history. The cathedral is open Monday to Friday from 8am to 6pm and Saturday and Sunday from 8:30am to 6pm.